White pumpkin(ash gourd) in Tamil it is called as thadiyangai or vellai poosani. 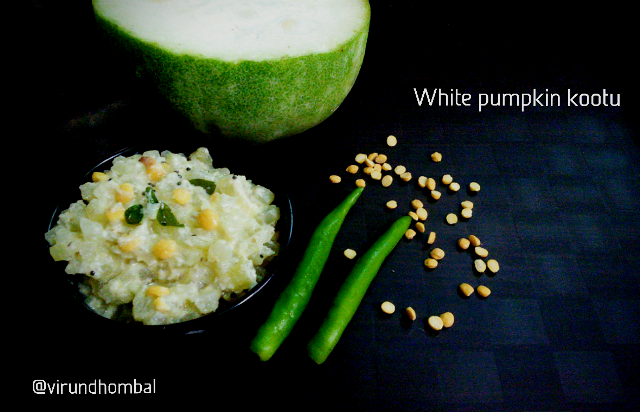 White pumpkin is popular in South Indian foods and widely used in kootu, sambar and patchadi. 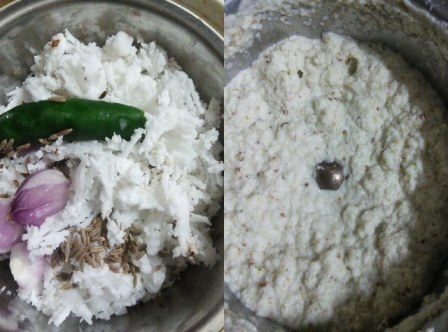 This white pumpkin kootu is a traditional dish in Tirunelveli. 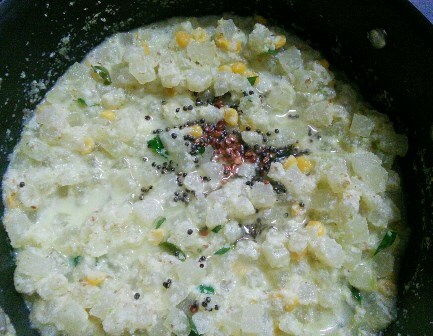 White pumpkin kootu is cooked with coconut paste and chana dal. 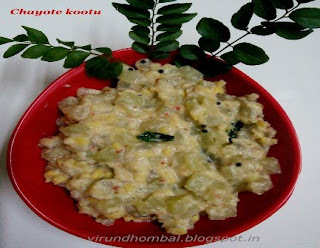 This kootu is a best choice to pair with sambar and pulikuzhambu. Just like my other kootu varieties, I recommend to cook in a deep vessel with frequent stirs. This method gives you the perfect results rather than pressure cooking. White pumpkin is popular in South Indian foods and widely used in kootu, sambar and patchadi. 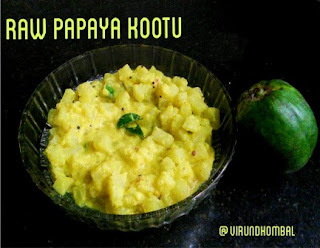 This kootu is a best choice to pair with sambar and pulikuzhambu. Place the pumpkin on a cutting board and cut them into small wedges and carefully peel the skins. Dice them into small cubes. Soak the chana dal for 20 minutes and pressure cook for 2 whistles. Add the pumpkin cubes in a deep vessel. Pour 1/2 cup of water and cook them on low heat. Check the pumpkins for every few minutes and cook. Grind the coconut, chilly, small onions and cumins.When the pumpkins are cooked, add the ground paste and add the required salt. After 5 minutes sprinkle the rice flour and mix them well. Give them a quick stir and continue to cook for 5 minutes.Turn off the heat and add the milk. Now heat oil in a pan and add the mustard, urid dal . Allow them to crackle and add it to the kootu. Mix them well. Place the pumpkin on a cutting board and cut them into small wedges and carefully peel the skins. Use a spoon and remove the seeds. Dice them into small cubes in uniform size. Add the pumpkin cubes in a deep vessel. Pour 1/2 cup of water and cook them on low heat. 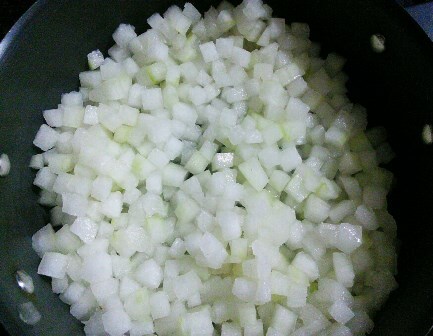 In the meantime, grind the coconut, chilly, small onions and cumin with little water. 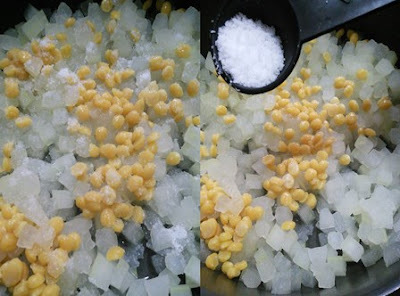 When the pumpkins are cooked well, add the cooked chana dal and the required salt. Next, add the ground coconut paste and mix them well with the pumpkins. 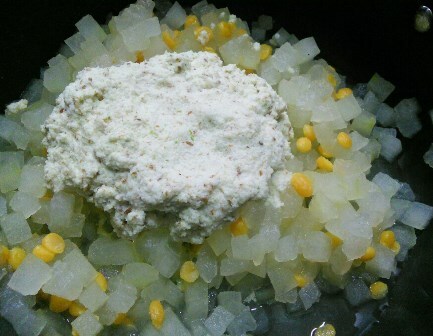 When the kootu starts boiling add the rice flour and mix them well. 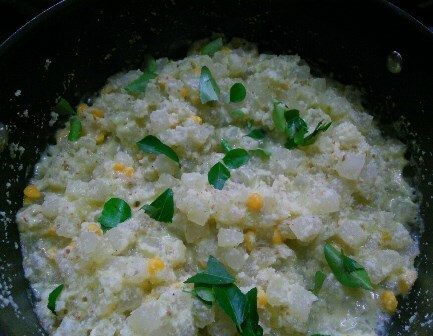 Continue to cook on a low heat for 5 to 7 minutes and add the fresh curry leaves. When the raw smell of the cumin and small onions goes off, turn off the heat. Add the milk and mix them well. Now heat coconut oil in a pan and add the mustard and urid dal . Allow them to crackle and add it to the kootu. Mix them well. 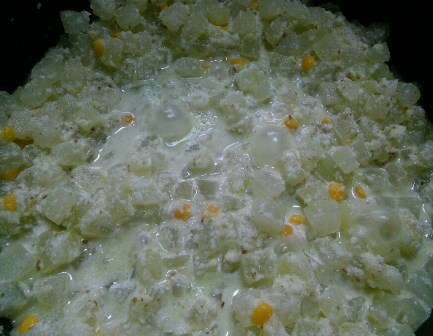 Yummy and healthy White pumpkin kootu is ready to serve. 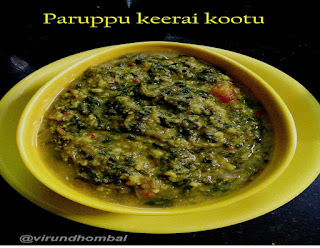 Serve it with pulikuzhambu, sambar or rasam. If you try this recipe for White pumpkin kootu send us your comments below and share the recipe for your friends and family.